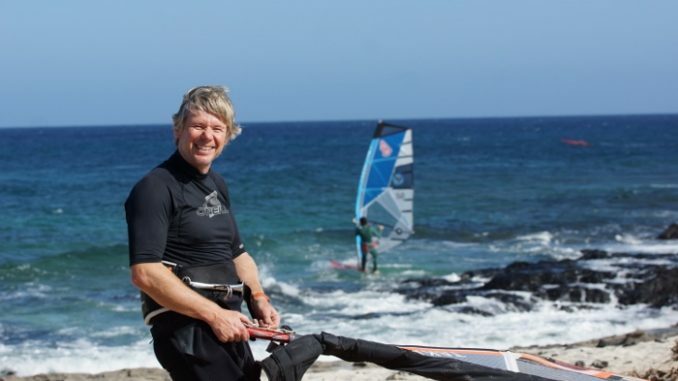 Regular Windsurfing UK contributor, Lanzarote loving, committed wave sailor and (now) BWA press officer Mark Dowson’s enthusiasm for windsurfing is second to none. Frequenting many different UK beaches, as well as putting in hours across the drink in Lanza, he’s a committed wave hound and a nice guy to boot. We caught up with Mark for a long overdue natter. 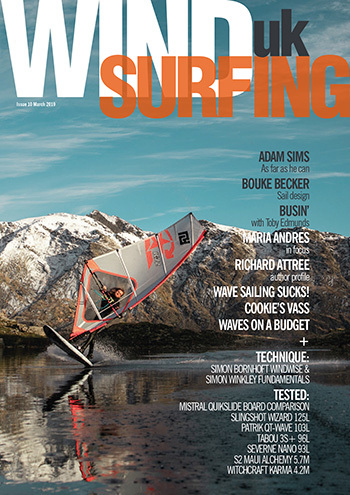 Tell us about your windsurfing background: where it started, who got you into windsurfing and what made the bug bite. I first got the chance to try windsurfing back in France on a BIC when I was 18. My friend, Nick, was working out there on a campsite and they had one as part of their setup for the campers. My brother and I had been itching to give it a try it as we’d seen it on TV and thought it looked amazing fun. It did not disappoint. From that first try we were both hooked and I’ve sailed every year and I just love it! Where’s your local these days, if you have one? 2018 (so far) has been a strange one – not that windy really. I have sailed 37 times so far this year and as usual it has been split between the UK and Lanzarote. In the UK I’ve sailed at Filey (1), Avon (1), Rhosneigr (5) and Fraisthorpe (14). In Lanzarote I have scored Jameos (9) and Costa Teguise (7). Who’s your crew that you hang out/sail with? The Fraisthorpe, East Yorkshire, crew would have to be Chris Sykes, Brad White and John Wright (who I’ve been sailing with a lot recently.) 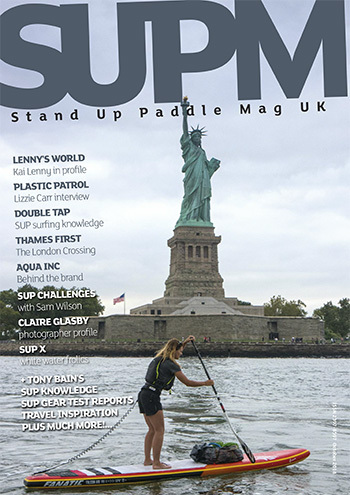 We have also had some memorable east coast adventures with Steve Thorp. In Rhosneigr I’ve sailed with George B & Phil Johnson for many years, Alex Tritten, John & Paul McLawrence and recently Steve Laddiman has been joining us on both coasts. The usual suspects in Costa Teguise are Rob Cattee & Claudio and in Jameos, Nejc Zupan & Tim Orchard. 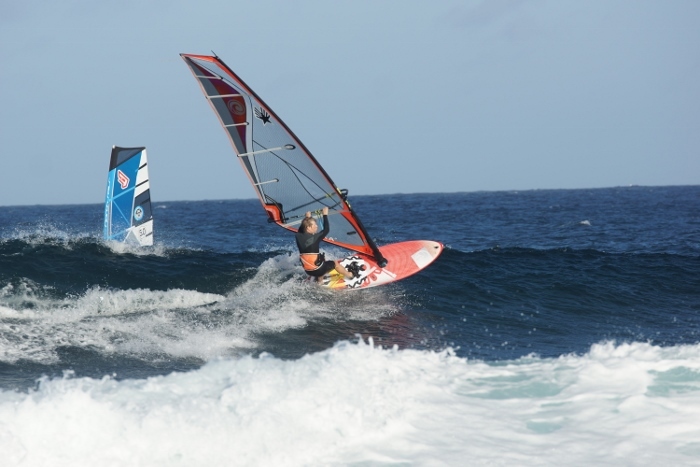 Why wave sailing in particular? Is it only wave that floats your boat or are you happy to blast about on the flat? I’d have to say yes to that, it’s definitely the wave sailing. I will go out in the flat just to get a bit of water time though. But for me it’s wave sailing, whether it be float and ride or full powered jumping and wave riding, there’s just nothing else that comes close to it. Talk to us about the gear your using and why. I’m riding for Juice Boardsports and I use the amazing Ezzy Takas & Elites. I love the comfort and control of these sails and they just ride the wave so well. I have two sets of gear one for the UK and a set I leave in Lanzarote. So for boards in Lanzarote I currently use ‘well worn’ RRD freestyle 101 and an even more worn RRD Wavecult 92. In the UK I have a Severne 101 Nuevo which is great for down the line cross off waves and a Simmer 85 for the strong stuff. Just recently I have added a Moo custom 99, made just for me and I bagged an ex-Steve Thorpe 80ish Moo for the stronger winds. You’re a big fan of Lanzarote, with lots of miles clocked up toing and froing to the island. What is it about the place you like and why? Yes, we have had a long love affair with the island. We have a small place out there and many, many happy holiday memories! Why? Well the weather, food, the windsurfing and it’s just a beautiful island that we love to spend time on. Any particularly memorable sessions from Lanza? There have been lots… lots! However a session this Easter at Jameos with Nejc and Tim stands out. We launched a mile downwind as the usual rock launch was a little dangerous with sizable waves and offshore winds. I still have the images in my mind of Tim and Nejc carving on the beautiful mast and a half set waves, I have never bottom turned so fast in my life! And what about spots yet still to ride? Do you fancy some of the big wave locations for instance? There’re a few new places on my list I’d like to score in some decent winter swells, but I’m content to sail decent waves in the usual spots. There’s always something to improve! Why do you think Lanzarote isn’t quite as popular with Brits as some of the other Canary Isles? Good question! There is a group of UK windsurfers who like myself love the island and return year after year or have made it home. The wind shadow on the inside at Costa Teguise is frustrating for many folk and maybe that puts some off. For me, this is a blessing as it keeps numbers on the reef down. Jameos, the best cross off, down the line location is also tricky as it is a rocky launch and a bit of a kit breaker so it is pretty quiet there too. What about other global locations? Anything elsewhere on your bucket list, and why? I’d like to try out South Africa for a couple of months. I’ve heard/seen how consistently good it is! Talk to us about your new role as British Wave Sailing’s Press Officer. What does this entail? Well I’m helping Geoff and Nigel out, as they asked me! It is surprising how much of their time they devote to running the BWA tour. It’s very early days so I’m still finding my feet, but so far it has been a lot of fun. We have started concentrating on Facebook coverage whilst Ben & Alfie of (WindsurfingTV) are doing an amazing job of the event round up videos. For the rest of the tour we are hoping to continue to offer the same forms of Facebook coverage that we did at the Rhosneigr Wave Classic as well as coverage in the windsurfing press. We are also aiming to promote the ‘Future Pro Wave Camps’ that have secured three year funding from the Mailing Room. These camps offer subsidised coaching (£10 a day for youngsters aged 10 to 17 at all the BWA camps. So if you know of any aspiring pros of the future it would be a see them there! Does this mean you’re pulled away from competing? I’m hoping it won’t mean that! I aim to compete in the masters this year and I expect it will have some impact but as long as I’m having fun that all is that matters. Time will tell, we have not had an event where I have done both yet. 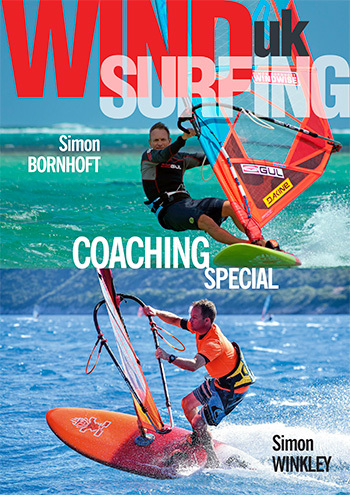 Learnt anything specific since taking on this role about the windsurfing media or other? Yes I have learnt a great deal. I am starting from knowing virtually nothing so I can only get better. Getting quality photographs for all the riders is really tricky and I’m trying to line up volunteer photographers for each fleet so that people can see themselves in action! You managed to nail a great result at the Gwithian comp in 2017 so will you be defending that? What about chasing the overall? I’ll be at Gwithian and I’ll give it my best shot, but I’m not at all confident that I’ll succeed in defending it as there are so many good riders in our fleet. Any of the guys could knock me out in a heat! The conditions will have an effect as different people rip in different conditions. Sometimes you get the waves and sometimes you don’t and that is what makes it interesting. I have also scored some amazing sailing in the week leading up to the competition so it’s worth going for that alone. For the overall master’s title I am sure it will be the same story, especially as the Avon event has been moved to September and that may encourage some of the new south coast faces to enter the fray! It also depends on who can do the whole BWA tour. If you miss one of the completed events then you cannot hope to get the overall title. This year will be the first time I manage to do all the events. I have already booked Tiree so won’t get the automatic 23 points added on (I normally cannot get out of work.) For me, the competition gives you something to aim for and the final standings are not the most important thing! Though I can’t deny it was an amazing feeling winning in Cornwall. Who’s your main rival (or rivals) when doing events? It’s a very friendly fleet and as I said previously any of the guys can easily take a heat. In Cornwall last year my main rival was Steve Laddiman, we sailed on the same side of the ladder and we ended up in the super final together. Grahame Pettit, Kyle McGinn, Justin Dennington, Jamie Bambridge were also all up there challenging at the top of our fleet. I’m sure there will be other faces appearing this year, Carl Tomlinson & John Mclawrence for example. For the overall we could see Rob Castle, Stuart Tilbury, Craig Hamilton, Galen Dickenson or Phil Anson push into some of the top 5 positions, it will depend upon who can do all the tour dates. 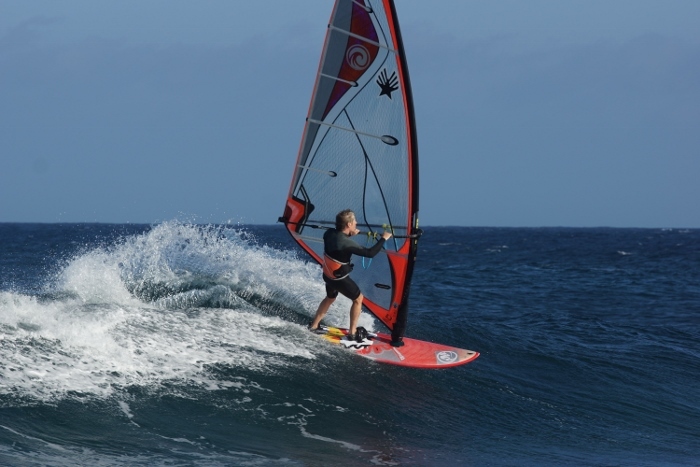 In one sentence sum up why other windsurfers should do a few comps? It’s great fun, you get to improve your sailing and sail with some of the best wave sailors in the UK. 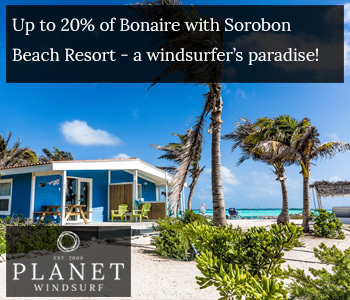 Any other plans windsurfing wise for the rest of 2018? 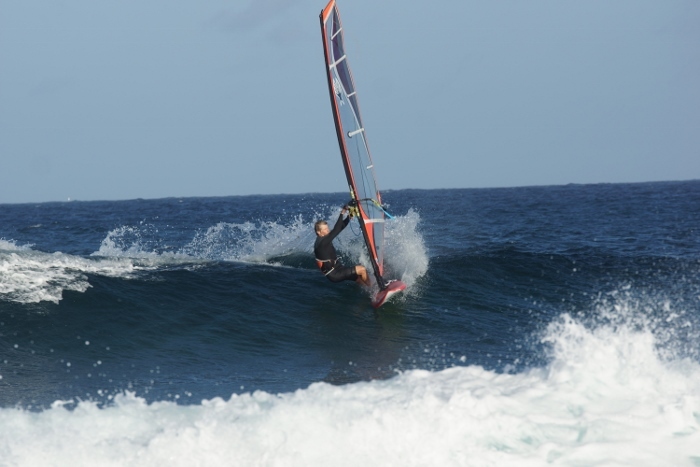 Summer training on Lanzarote and as much UK sailing as possible before the next events! Final thoughts, thanks and praise? Thanks and praise must go to Nigel Treacy and Geoff Hautman for all the hard work they put into the BWA. Also to all the judges and event hosts who make the tour happen. 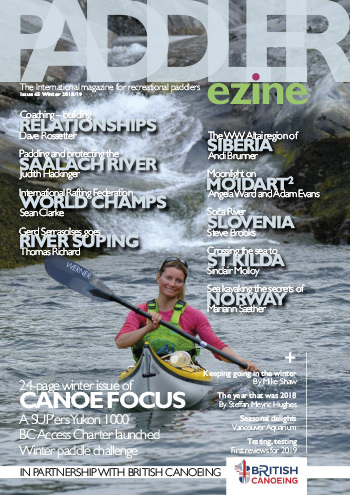 Finally all the folk on tour who make it a hoot and all the guys who help me to improve when I free sail – Russell Groves & Nejc Zupan, Brad White, Steve Laddiman & Steve Thorp to name a few! 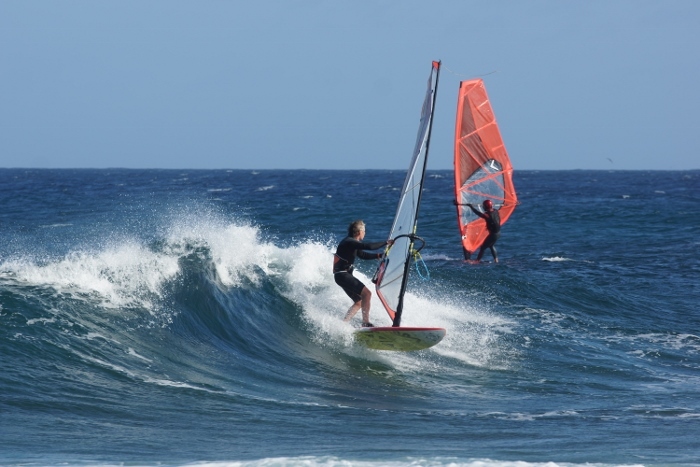 Fantastic sails and boards from Gump at Juice Boardsports & John at Moo. Finally thanks and praise to all the family for putting up with the windsurfing obsession.